The Wyse S10 Thin Client is the most optimized solution for Citrix ICA (MetaFrame Presentation Server) and Microsoft RDP (Terminal Services) environments. The Wyse S10 combines great performance, stateless operation, low power consumption, USB ports, remote management, and simple device setup and imaging. This small, lightweight, solid-state (all electronic, with no disk or fan) unit can be mounted out of the way, even on the back of a display, making the S10 ideal for any space-constrained environment. Small on size also means small on energy consumption, as each Wyse S10 draws just 6.6 watts of power and creates very little heat. As a result each Wyse S10 contributes to cooler working environments, greatly reduced carbon footprints and huge savings in energy costs when compared to equivalent PC desktops. Questions about the Wyse S10 Thin Client? We can help. For more information about the Wyse S10 Thin Client, or any of our products and services, call us at 1.800.457.8499 or email us. 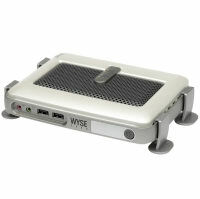 Order your Wyse S10 Thin Client today. Order your Wyse S10 Thin Client now. Your purchase order, with credit approval, is welcome, as well as all major credit cards, PayPal and Google Checkout. Remember, you'll get FREE technical service with every product you buy from Vecmar.